Antioch Foot and Ankle Group is “stepping up to the plate” to support a worthy causes in Savannah. Recently, the staff formed a Walk-a-thon Team and plan to participate in local walk-a-thons to raise funds and awareness. The groups first event was the March of Dimes March for Babies six mile walk that began in Daffin Park. Antioch Foot and Ankle Group President, Dr. Jim Dandy lead the newest member of his podiatry practice, Dr. Kristian Jeffress, Team Captain, Keyleenia Yhap, and the medical staff on the walk to the finishline. 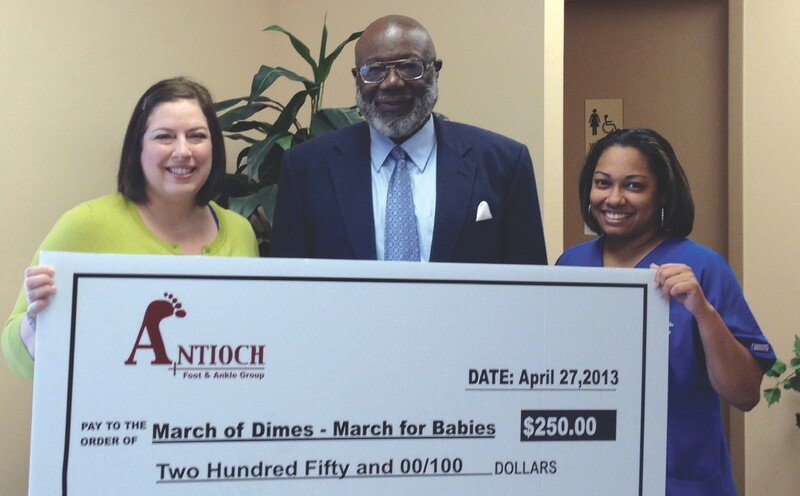 Dr. Dandy presented a check, in the amount of $250, the following week to March of Dimes Director, Laura Thompson, on behalf of Antioch Foot and Ankle Group. Dr. Dandy is committed to becoming more involved with the community and giving to causes like the March of Dimes.